When only the tastiest gourmet unpopped popcorn will do, turn to the top-quality selection at Whirley Pop Shop. 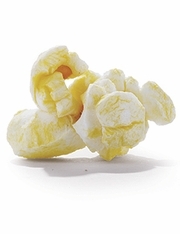 We offer an extensive array of gourmet popping corn kernels to satisfy every popcorn fan, including Big & Yellow, Tender & White, and Extra Large Caramel varieties. Our heirloom popcorn collection is unsurpassed for terrific taste and texture, making every time you eat popcorn an occasion to remember! We offer popcorn for popcorn machines of all sizes. If you�re looking for just a little, consider a 4 oz. or 1 lb. bag. Want to keep a few more kernels on hand so your Whirley Pop doesn�t ever go hungry? A 2 lb. or 6 lb. bag of gourmet unpopped popcorn should suit you just fine! Shopping for something on a larger scale, such as a concession stand? We have you covered, too. Our 50 lb. bag of popcorn for popcorn machines keeps the fluffy stuff popping until everyone has had their fill. With our affordable prices, there�s no need to settle for anything less than the best. Shop our heirloom popcorn, and get ready to treat your taste buds right!